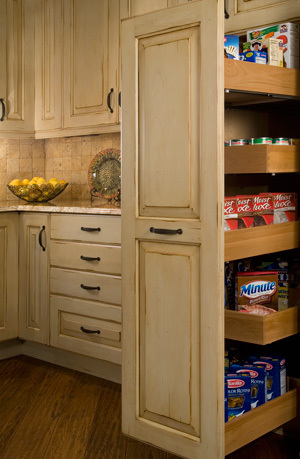 Pull-out pantry cabinets make storage convenient for the whole family. We are often asked what is new or most popular for kitchens to improve efficiency and function. There are so many answers to that question! In fact, we are going to do two posts to show you much of what we love about kitchen organization and design. This post — Part 1 — focuses on cabinetry with kitchen cabinet organization tips. • Do you have plastic storage containers and lids floating around your kitchen? Those oddly shaped Tupperware and Rubbermaid containers can be difficult to keep organized. We have two ideas for you. 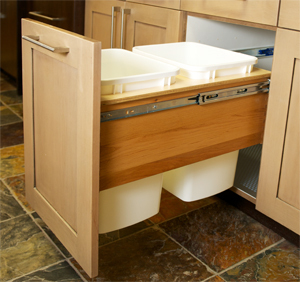 One is a simple organizing insert that sits in your cabinet to keep containers and lids in their place. But another more permanent solution is a drawer system below the microwave that is even more specialized and makes organizing various sizes and shapes even easier. Dual trash receptacles allow you to separate recycling from trash and can be hidden away. • Speaking of drawers, those pots and pan lids can also be a struggle for storage. We install a drawer with about an 8-inch height under the cooktop just for lids. More drawers under that one hold the actual pots and pans, but keeping the lids separate makes a much faster way for you to find what you need. • Double-sided pull-out cabinets are probably our most asked-for specialty cabinet. And why not? They are super convenient and save space as well. These cabinets come in all lengths from a full-size pantry to a smaller base cabinet size. We also have very narrow styles of this cabinet that are perfect for a spice rack. 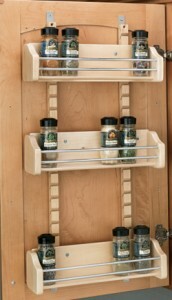 Spice racks added inside your cabinet doors organize bottles for fast finding. 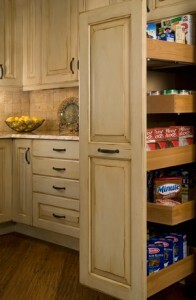 • Another spice storage option is to install the rack on the inside of the cabinet door. So instead of all those bottles stacked on a shelf, you secure them in even rows along the door. This is especially handy when you are cooking and need to find a spice fast! • Does your bread need a home? Yes, there are bread drawers. It might sound extravagant but it’s actually a great way to keep moisture away from your bread, and it comes with a cutting board that slides across the top of the drawer for quick and clean sandwich-making. • Most of us are recycling these days, but trying to keep trash separate from recycling can be a pain. Dual pull-out receptacles solve that problem with side-by-side bins that hold trash and recycling. And they neatly hide away when the cabinet is closed, taking any mess and odor with them. We will be back next week with Part 2 of our kitchen ideas. 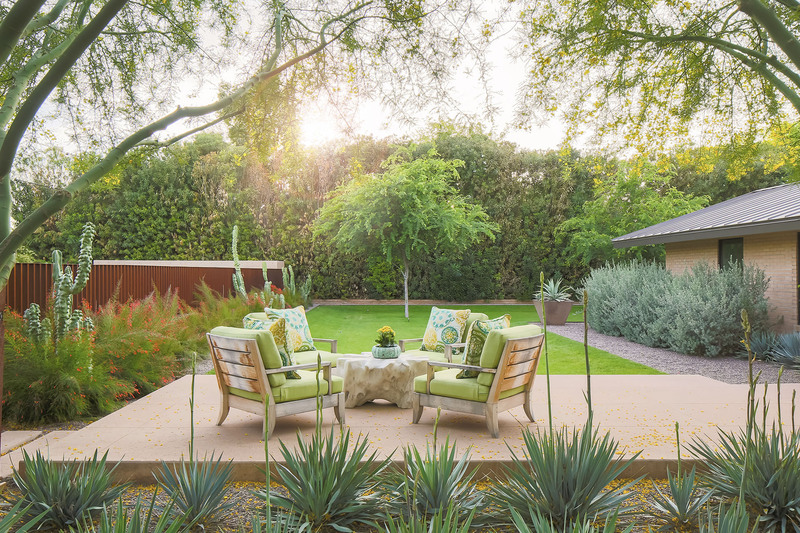 Meanwhile, if we can assist you in redesigning your kitchen — or with any of your design needs — please contact us for a complimentary consultation.